December is hard for me. I love the idea of a beautifully decorated home filled with the smells of gingerbread and fresh cut greens. But somehow, every year, it remains just an idea, a longing, that ultimately eludes me. The reality is, I spend most of the year trying desperately to get organized and maintain what little controlled chaos I’m able to manage. 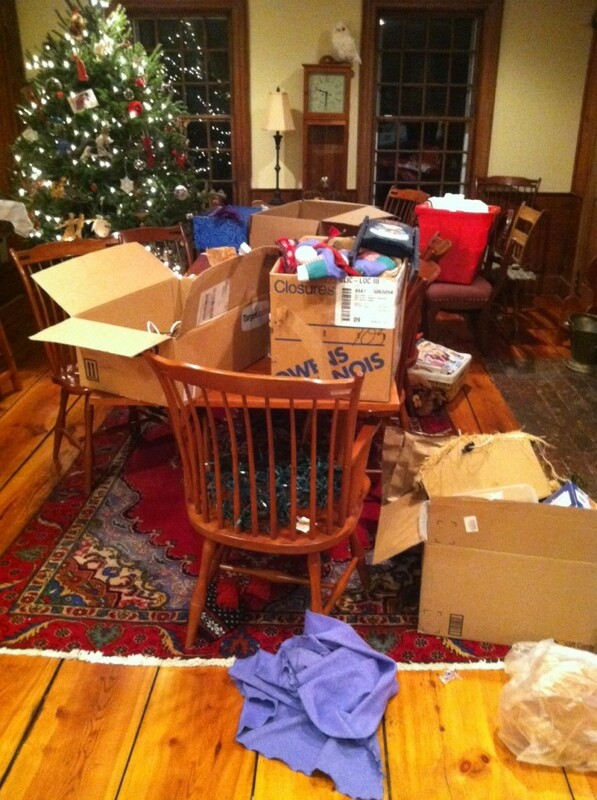 And then along come the holidays and suddenly my entire living room is full of the cardboard boxes stuffed with the ornaments and decorations that I swore I would organize before putting them back in the attic last year. I’m pretty sure it was around March when I finally gave up on any hope of that happening and hauled the disarray back up the attic stairs. And now, once again it all litters my living room. I’m already making promises to myself that this year will be different. I know what you’re thinking, but this year it might actually be true. Here’s why. Remember earlier in the fall when I wrote about fear and how when you speak your fear aloud it loses its power and control over you? Well, I think that holds true for other emotions and attributes as well. In this case, it was admitting to a friend, a friend I really admire, how deeply disorganized my life is. “I’m barely hanging on by a thread,” I’d said, detailing missed deadlines, double-scheduled appointments and numerous late charges on misplaced bills. Saying that out loud, admitting that truth to someone outside our home, was freeing. Speaking those words released some of the shame I’d been carrying for far too long. My friend didn’t laugh or dismiss my confession. Instead, he handed me a book. Have you ever held a book and felt it vibrate in your hand? 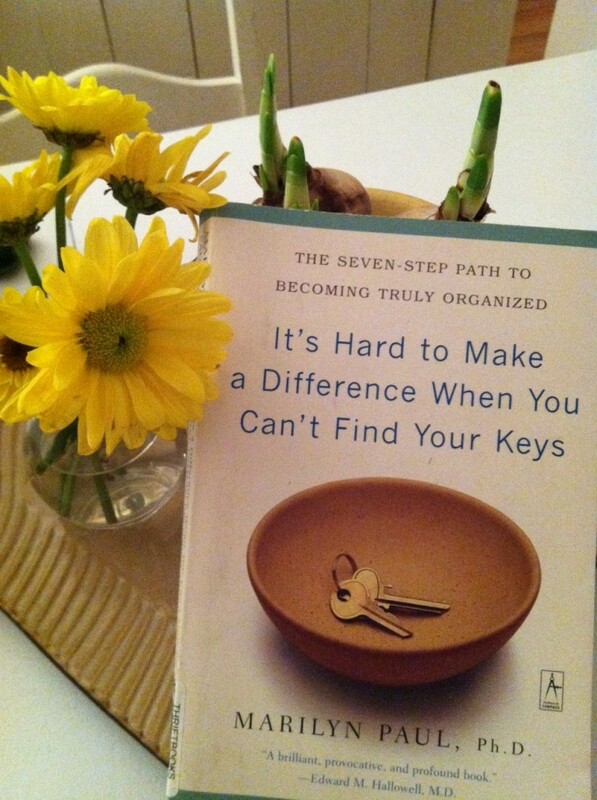 That’s what it felt like when I held It’s Hard to Make a Difference When You Can’t Find Your Keys by Marilyn Paul. I knew I was holding something that was likely to alter the course of my life. That sounds awfully dramatic, I know, but it’s true. What’s different about this book is that it approaches organization from a spiritual point of view, and if you’ve read my book, you know that’s how I roll! The main theory behind the book is discovering the WHY behind the disorganization, and once I discovered my why, or whys, I made several little changes that proved significant. I never, ever thought I’d say this, but here goes…I not only bought, but LOVE my label maker. Seriously, I do. 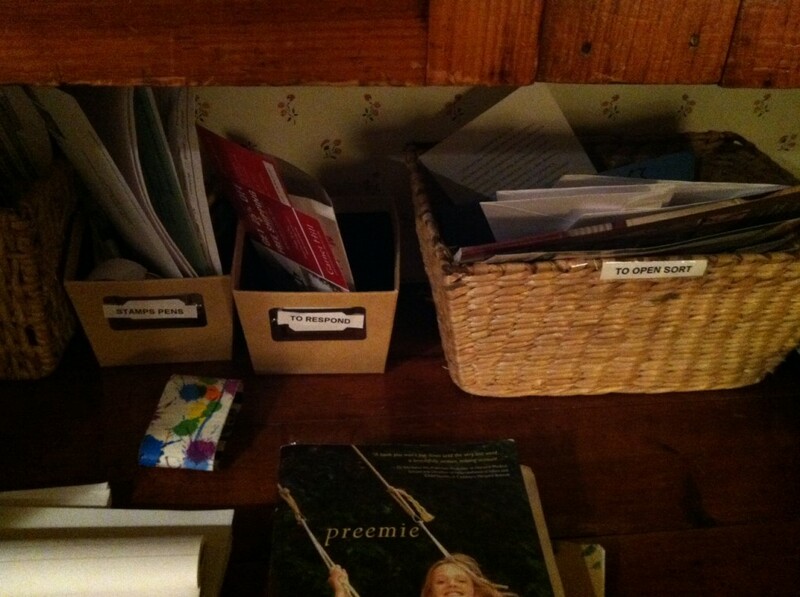 It was about $25 bucks and now there are labels on the shelves in the kid’s closets so they know where all their clothes belong and my kitchen junk drawer no longer looks so junky and now we can all find pencils and pens and I even have a working mail system for the first time in my life! 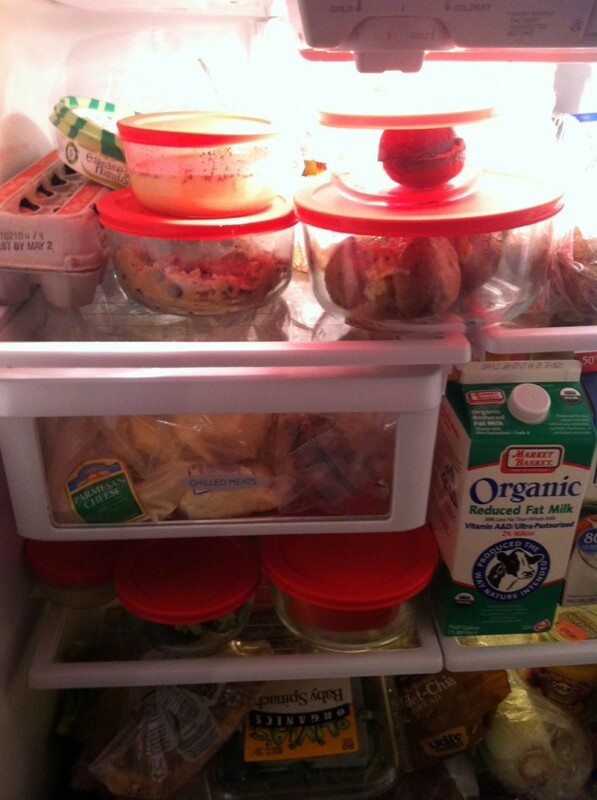 Another change occurred when my sister mentioned that she’d gotten rid of most of her plastic food containers and started using glass storage for leftover food. So I decided to make the change, too. And what a difference! Now I can see what’s inside my fridge, and I’m no longer throwing away the expensive leftover grass-fed ground beef that was hidden in a large yogurt container on the bottom shelf. I can’t help but think that I’m not alone in this perpetual quest for order and so, here’s what I’m going to do. Because it’s the season of giving and expressing gratitude, I’d like to express mine to all of you for the tremendous support you’ve shown me as I’ve navigated my way through this wild world of book publication with a GIVEAWAY! One lucky reader, will receive a copy of, It’s Hard to Make a Difference When You Can’t Find Your Keys. AND another lucky reader will receive a set of the glass storage dishes that have brought such order to my kitchen! Don’t they look kind of Holidayish with those red lids? Leave a comment by December 28th and tell me why you would benefit from either of these gifts, or offer me one of your best organizational tips. Each comment will be assigned a number and chosen by Random.com. Good Luck! I’ll let you know come January if I manage to finally get all the Christmas trappings back in their boxes in a somewhat orderly way. Chance are, if it’s all back in the attic by January, I found success!